Atlantic Wind Transfers, Blount Boats and Deepwater Wind welcome key U.S. Atlantic Wind Transfers, the commercial wind support services arm of Rhode Island Fast Ferry, joined boat builder Blount Boats and offshore wind developer Deepwater Wind on August 12 for an official Ribbon Cutting ceremony and to tour the first offshore wind farm crew transfer vessel in the U.S currently under construction. 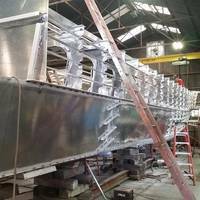 The event at the Blount Boats yard in Warren, R.I., brought together local supply chain businesses to celebrate the economic benefits of the Block Island Wind Farm project to U.S. firms. China asked the United States to take no position on the South China Sea issue after US Navy Officer Robert Thomas promised to back the Association of Southeast Asian Nations (ASEAN) in patrolling areas of the waterway. "We hope the United States will strictly honor its commitment of not taking positions or sides on territorial sovereignty issues," said Chinese Foreign Ministry spokesperson Hong Lei. The U.S. navy officer suggested on Tuesday that the Southeast Asian countries form a combined maritime force to patrol areas of the South China Sea. 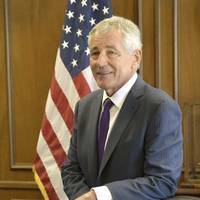 U.S. Defense Secretary Chuck Hagel resigned on Monday, the first major change to President Barack Obama's Cabinet since his Democrats were routed in midterm elections three weeks ago. Obama announced the resignation at a White House event with Hagel at his side. Hagel will remain in the job until a successor is in place. Hagel was appointed less than two years ago as Obama pushed his signature program of winding up wars in Afghanistan and Iraq, a process that is being upended this year with U.S. re-engagement in Iraq and greater military cooperation with Kabul. The Naval Undersea Warfare Center (NUWC) Division Newport dedicated a new $24.9 million Virginia Payload Tube Facility (VPTF) with a ribbon cutting today, Wednesday, October 15. The ceremony was followed by an opportunity for businesses with an interest in the technology to tour the facility and learn about its capabilities. Rhode Island Governor Lincoln Chafee, U.S. Senator Jack Reed and U.S. Congressman James Langevin attended the ceremony. 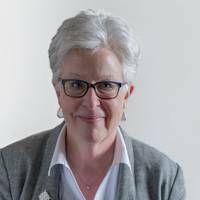 “Since forming the Torpedo Station on Goat Island, [NUWC] has been the center of cutting-edge research of undersea technologies,” Reed said. 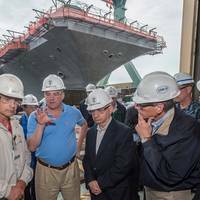 Huntington Ingalls Industries (HII) hosted U.S. Sens. Tim Kaine (D-Va.) and Jack Reed (D-R.I.) Tuesday for a tour of the company's Newport News Shipbuilding division. The visit provided the senators an opportunity to meet shipbuilders and see construction progress being made on all programs across the shipyard. Huntington Ingalls Industries President and CEO Mike Petters and Newport News Shipbuilding President Matt Mulherin were joined by Adm. M.E. Ferguson, vice chief of naval operations, the Hon. 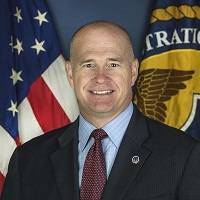 Sean J. Stackley, assistant secretary of the Navy, and Rear Adm.
One of the most important components of a healthy economy is modern port infrastructure to feed our maritime transportation system. By investing in waterways, jobs are created, economic competitiveness is improved and prosperity is built for the long term. 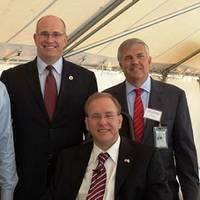 At the Rhode Island Ports Showcase in Providence, Acting Maritime Administrator, Paul "Chip" Jaenichen spoke about DOT’s commitment to making such investments. At the Port of Providence alone, port-related employment has grown from 800 jobs 15 years ago to 2,400 jobs today. 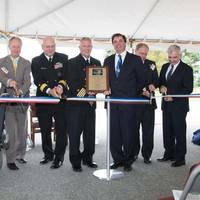 The Naval Undersea Warfare Center (NUWC) Division Newport cut the ribbon and officially dedicated a new $11 million Maritime Subsurface Sensor Operations Laboratory on Tuesday, Aug. 16. Sen. Jack Reed and Sen. Sheldon Whitehouse attended the event, as well as Rep. David Cicilline. NUWC attendees included the Warfare Center Commander Rear Adm. Thomas Wears and NUWC Technical Director Donald McCormack, and the NUWC Newport Technical Director Dr. Paul Lefebvre. 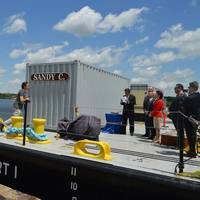 "This project resulted in a significant addition to the towed array facility and a major upgrade to our capabilities," said Wears. Under construction since its July 31, 2009 ground breaking, the 40,000-square-foot, single-story laboratory provides secure workspace for the testing, refurbishment, and maintenance of towed arrays. 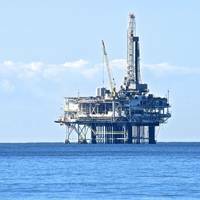 The American Shipbuilding Association (ASA) announced that U.S. Senator Thad Cochran (R-MS) would be the 2010 recipient of the Herbert H. Bateman Award. The award will be presented Wednesday, June 23 at 6:00 pm during ASA's Salute to the Illih Congress reception in the Gold Room (2168) of the Rayburn House Office Building. "Thad Cochran, throughout his 38 years of service in the U.S. House of Representatives and in the U.S. Senate, has been a tireless advocate for a stronger shipbuilding industry and our Nation's sea services. The American Shipbuilding Association (ASA) announced that Senator Jack Reed (D-RI) is the 2009 recipient of the Herbert H. Bateman Award. This award was presented on Wednesday, May 13th at 6:00 pm during ASA’s Salute to the 111th Congress reception in the Gold Room (2168) of the Rayburn House Office Building. Elected to the U.S. Senate in 1996, Senator Reed is a senior Member of the Armed Services Committee, a Member of the Subcommittee on Seapower, and a Member of the Appropriations Committee. Senator Jack Reed has dedicated his years in the United States Senate to working men and women who build the finest submarines and surface ships in the world so that American Sailors, Marines, and Coast Guardsmen and women have the best in executing their missions. On a crisp fall morning in Newport, R.I., friends, family, veterans and special guests gathered to watch as USS Chafee (DDG 90), the Navy's newest warship, was formally commissioned honoring the late Sen. John H. Chafee of Rhode Island. Chafee, a decorated Marine veteran of World War II and Korea, also served as Secretary of the Navy prior to being elected U.S. senator. With the historic and now retired aircraft carriers USS Forrestal (CVA 59) and USS Saratoga (CV 60) in the background, more than 6,000 supporters braved the blustery winds off Narragansett Bay to witness the historic commissioning. Speakers included U.S. Senators from Rhode Island Jack Reed and Lincoln Chafee, son of the ship's namesake. "Today is a proud day," said Reed. "This ship bears an even prouder name. Sen. Yesterday in Washington, D.C., leaders from the Senate, the military and business met to discuss strategies to increase FY 03 procurement funding by at least $2.9 billion to build more new navy ships. Concerned that funding is inadequate to maintain the Federally mandated 300-ship navy as required by the 2001 Quadrennial Defense Review, leaders sought to bring publicity to their plight, magnifying the depth of their need while celebrating the success of the navy in response to the September 11 terrorist attacks. The current budget requests $6.1 billion for five new ships, a figure that is $5 billion below the previous administrations FY ‘01 shipbuilding procurement budget. On Friday, June 23, 2006, Senators Susan Collins (R-ME); Jack Reed (D-RI); Trent Lott (R-MS); Jim Talent (R-MO); Olympia Snowe (R-ME); Christopher Dodd (D-CT); Lincoln Chafee (R-RI); Mike Dewine (R-OH); Lindsey Graham (R-SC); Daniel Akaka (D-HI), David Vitter (R-LA); Frank Lautenberg (D-NJ); Bill Nelson (D-FL); Joe Leiberman (D-CT); Maria Cantwell (D-WA), and; Mary Landrieu (D-LA) sent a letter to Secretary of Defense, Donald H. Rumseld, asking him to increase the Navy’s top line budget for the purpose of increasing the ship procurement budget in fiscal year 2008. The request comes on the heels of a letter sent by members of the House of Representatives Congressional Shipbuilding Caucus urging support for the Chief of Naval Operations (CNO), Adm. Michael C.
Demonstrating an affordable and proven capability to strengthen America's port security, Raytheon Integrated Defense Systems (IDS) officials and Rhode Island legislative leaders recently commemorated the opening of the Athena Maritime Domain Awareness Fusion Center with a ribbon cutting ceremony. The Athena system fuses a large number of existing sensor data to provide decision makers with the real-time maritime situational awareness they need to enable quick, responsive actions to protect the country's shoreline. Attending the event were Gov. Don Carcieri, Sen. Jack Reed, Sen. Lincoln Davenport Chafee, Congressman Patrick Kennedy, and Congressman Jim Langevin, who joined IDS President Dan Smith and Petryszyn in cutting the ribbon.